Happy Birthday Diablo III! The game came out three years ago and an anniversary like this means a special event. This time it’s a Cowpocalypse, and it’ll be a nostalgic one for all Diablo fans. - says the anniversary post. This means PC / PS4 / Xbox One players who log in from May 15 to May 21 will most likely encounter special Treasure Goblins with Cow Level portals and will be able to slay some moo-mooing beasts upon entering them. It’s not available for PS3 and Xbox 360 players though, they’ve got a +100% EXP and Gold buff instead. 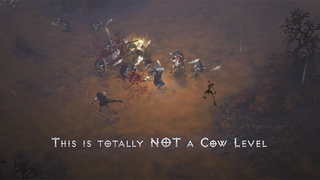 Cows are not a new addition to Diablo III, but their spawn rate was ridiculously low. So it’s worth logging in and finally slay them all like it’s a nostalgic trip to Diablo II.